Oils Polishes &Waxes – The Country Stripper, Inc.
Butcher Block Oil is an excellent protectant for all butcher block surfaces and excellent for protecting wood surfaces that come in contact with food: Simply wipe on, allow 5 minutes to penetrate and wipe off the excess. Use on cutting boards, utensils, bowls, butcher blocks, etc. Odorless. 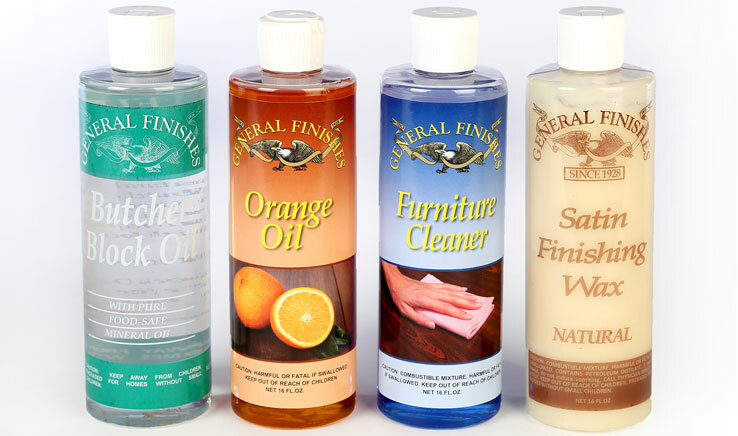 Orange Oil is by far our most popular and natural furniture care product. It can be used on any finish and does a superb job of removing everyday dirt and dust. It is often compared to lemon oil – however the big difference is that lemon oil contains mineral spirits. Orange Oil is all natural, non-combustible and made from real orange rinds. We love its fresh orange scent. Furniture Cleaner is our strongest heavy duty cleaner with a mineral spirits base and is designed for serious cleaning applications. Apply with a 0000 grade steel wool to remove old oils, wax and grease from any wood surface. Satin Finishing Wax is a dual-purpose product. It can be used as a polish for rubbing out new finishes or as a scratch remover for worn surfaces. It works well over both oil and water based finishes, including Danish Oil. We recommend a wet sanding process followed by buffing to a soft silky sheen.